I, along with all the people, priests and religious of the Diocese of Down and Connor, warmly welcome the news today that the Holy Father Pope Francis has appointed Fr Alan McGuckian SJ as the new Bishop of Raphoe. I have had the pleasure of personally knowing and working closely alongside Fr Alan since my appointment as Bishop of Down and Connor in June 2008, particularly in his various roles as Director of the Living Church Office and as Director of the Permanent Diaconate programme. I have been deeply impressed by his grounded faith and his pastoral sensitivity. His work with the pastoral care for the faithful who worship and celebrate the sacraments in the Irish language, Ár dTeanga Dhúchais, in Belfast over many years was greatly appreciated and treasured by many. Fr Alan is a native son of the Diocese of Down and Connor, growing up in Cloughmills, Co. Antrim. It was here that he, along with two of his three brothers, Bernard and Michael, responded to a priestly vocation and joined the Society of Jesus (Jesuits). After completing philosophical and theological studies at Milltown Institute, Dublin and Regis College, Toronto, Fr Alan was invited by the Jesuit Order to teach in Clongowes Wood College in Co. Kildare. He was ordained a priest for the Society of Jesus in June 1984. As part of his final stage of Jesuit training, he was appointed to minister for a short time in Shembagnur in India. In 1999, having completed further studies in communications in Missouri, Fr Alan returned to Dublin and established, working alongside the founders of Catholic Ireland, the website called ‘Sacred Space’, an online prayer website which continues to offer people an opportunity to develop their prayer life as part of a global virtual community. Fr Alan will also be known widely as an effective communicator on the local BBC Radio Ulster with his insightful and reflective contributions to ‘Thought for the Day’ and ‘Sunday Sequence’ programmes. In 2007, Fr Alan returned to his native Diocese, to work in the Jesuit community in Belfast and took up an appointment as Chaplain at the Ulster University, Jordanstown. While living in Belfast, he also engaged widely in ecumenical work throughout the city and beyond leading numerous Ignatian missions, guided prayer and spiritual direction programmes. Since his appointment as Director of the Down and Connor ‘Living Church’ project in 2011, Fr Alan has facilitated a pastoral programme of discernment and renewal within the Diocese. 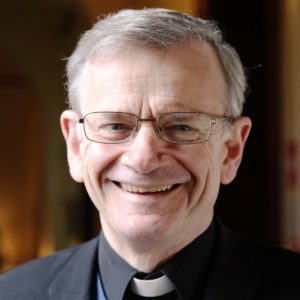 As part of this renewal process, he has been given the utmost respect from diocesan clergy and parishioners alike and he will be sadly missed by all for the vision, leadership and guidance he brought to this work. In this important and innovative diocesan project, Fr Alan adopted a truly collaborative style of pastoral ministry, a legacy which has become the hallmark of the entire ‘Living Church’ initiative. Undoubtedly, Fr Alan brings tremendous gifts to his new appointment as Bishop. His greatest charism, building upon his Ignatian training and spirituality, is his wonderful ability to engage others in a process of discernment employing his tremendous skills in facilitating mediation. The clergy and faithful of the Diocese of Raphoe, in this appointment, have been graced with a man and a priest of outstanding experience and indeed with the historic appointment of the first Jesuit bishop in Ireland. I look forward to working with Fr Alan in the future and I assure him of my heartfelt support and prayers, alongside all from the Diocese of Down and Connor, and I pray that God will bestow upon him a very fruitful ministry in his new appointment. I take this opportunity to also pay tribute to Bishop Philip Boyce, who has faithfully served the Diocese of Raphoe and the Irish Bishops’ Conference with loyal dedication and wisdom since his appointment in 1995. In the coming years, I wish him good health, a happy retirement and God’s blessing. inscrúdaithe do chách a charann iad. agus maireann a fhíréantacht go brách.